FOMO is all over the social media news web this week. The acronym sums up a common complaint or condition – just not being able to put social media down ‘cos you don’t want to miss out on the latest update. Problem is, 70% of “noise” that comes through on social media isn’t really relevant to us. Yet, we can’t help but check, because the remaining 30% can truly be life-changing, business-transforming, or just side-splittingly funny.We’re checking every 10 minutes. We’re thinking about it when we’re in the bath, at a wedding, having a drink with mates. And god forbid, when we lose signal going through the tunnel on a train! YOLO – you only live once – has become FOMO – a chronic, compulsive, and sometimes-damaging FEAR OF MISSING OUT. Using a ruthless time-limiting program will ensure you spend your social media time making productive headway instead of derping around. A couple of my favourites are Self-Control (for Mac), and Rescue Time (for any system.) There’s no way around Self-Control’s draconian blocking system – even rebooting your system doesn’t get round it. And you can use it for any distracting website – not just social network. The idea is to spend the time you need on social media sites, then to block them for a duration that you set. Then you can get on with other stuff. Rescue Time works the other way round, using the power of deadlines to force focus. Rather than blocking straight out, it lets you set time limits for using social networks. Go over the time limit, and BAM – you’re cut off. This means being merciless. Have a plan. On Twitter, cut out the swathe of users who don’t interact with you, and you’ll cut right down on irrelevant updates. What’s your purpose on social media? However you do it, your ultimate aim is going to be creating more business. Keep lists of people who you want to engage with to reach your aim, and stick to it. 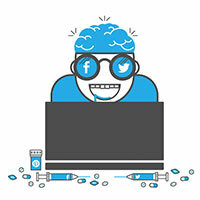 Have fun with social media – but keep your usage controlled and focused for the very best results. Taking a break from social media? Let the experts manage it for you. Get in touch with MySocialAgency today!